In the top right hand corner click on My Account. Add your username and password and click on Sign in Using our Secure Server. Once you are logged in, from the Services menu click on the service you want. In this case we want S3. This will take you to your Buckets where your products are stored. 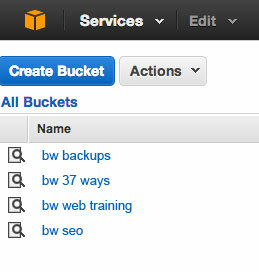 Select the Bucket where your product is stored and click on it to open. From inside the bucket you will see all the items stored in that bucket. 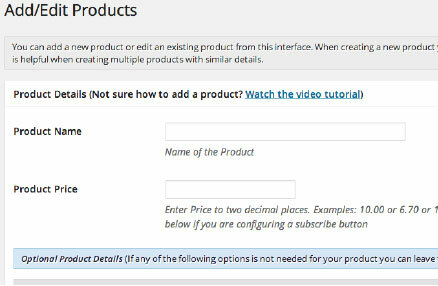 To download the product you want, click in the box at the beginning of the line. From the top menu, under Actions, click on Download and save the file to your computer. 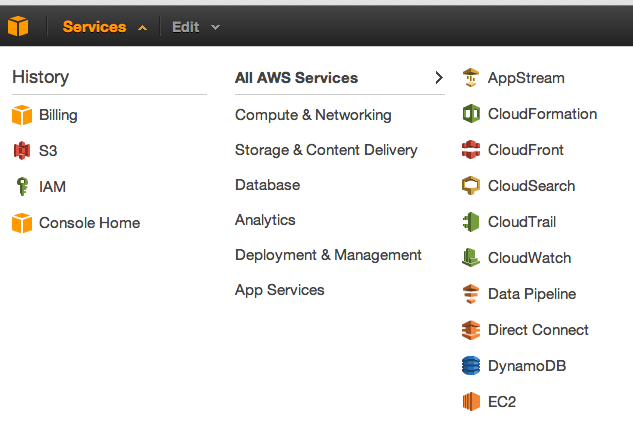 Log out of Amazon S3. 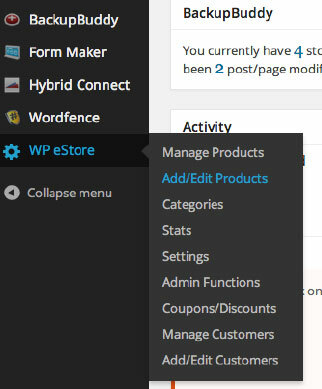 From the left hand column on the dashboard, click on WP eStore, Add/Edit Product. Where indicated add your Product Name and Product Price. Click on the + beside Additional Product Details. Add your “Product Description” in the area provided. Next you need to upload your image. Beside Thumbnail Image URL, click on Upload File. From this window you can either drag and drop your image into the appropriate marked area, or click on Select Files and select the file from your computer. Add “alternative text”. This text will be visible if, for some reason, the image doesn’t load so make it relevant. Make the alignment “center” and the size full size. Click on “Insert into Post”. Note: images need to be square and approximately 136 x 136 pixels. If you need to alter an image, go to http://pixlr.com. Name your images with thought as to what they are. Never use pic1.jpg. Use descriptive words because Google search engines will use image names to help with SEO. Don’t leave any spaces between words in the file name. So use personalsuccess.jpg or personal-success.jpg and not personal success.jpg. If I am using the same image in two different places on the web and with different sizes, I will often add the size of the image to the name so I can tell them apart, i.e. personal-success-136×136.jpg. Once this is done go down to the bottom of the page and click “Save Product”. We now need to add the download link for the file. Click on Digital Content Details. Beside Digital Product URL place the URL that you have extracted from Amazon W3. Go to the bottom of the page and click on “Save Product”. When you have clicked on Save Product, you will be taken back to the top of the page. 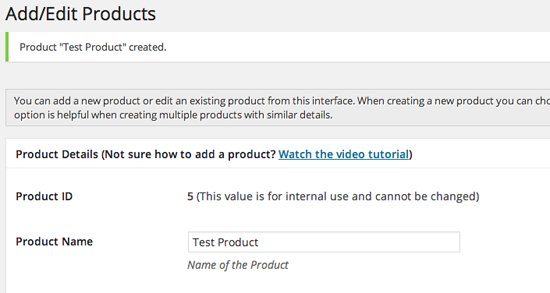 Under Product Details you will see Product ID. Please take note of the Product ID number. 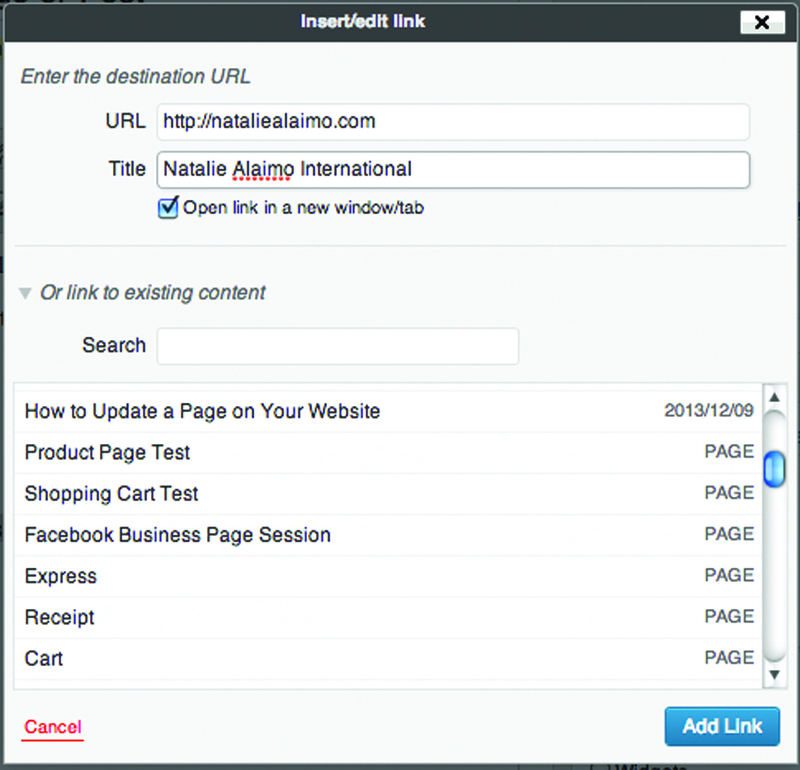 You will need this ID for the next step when you are inserting the product onto a page. Now that your product has been saved we have to add it to a page, or into the shopping cart. Navigate to the appropriate page. Click on the shopping cart image. This will bring up a box WP eStore Shortcodes. Select the shortcode you want to showcase your product. We’re using Fancy 2 shortcode which is [wp_eStore_fancy2 id=##]. Check out the Shortcodes and Functions here http://www.tipsandtricks-hq.com/ecommerce/wp-content/uploads/wp-estore-shortcodes.pdf or this page will show how they will look on your page http://www.tipsandtricks-hq.com/ecommerce/stylish-product-display-options-for-wp-estore-829. 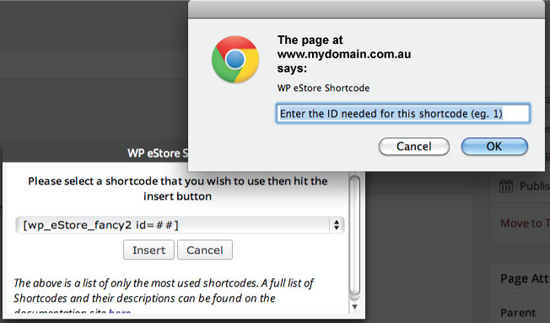 When you have selected the shortcode [wp_eStore_fancy2 id=##] click on enter. A box will appear telling you that you have to enter the id. Click OK and you will be taken to the webpage where you will see the code and you will have to add your ID. Here you can see your webpage with the code inserted. You now have to remove “Enter the ID needed for this shotcode (eg. 1)” and place your ID there so it looks like [wp_eStore_fancy2 id=4]. When you have the ID correctly inserted into the code, click on publish. Below is an image of the finished product. 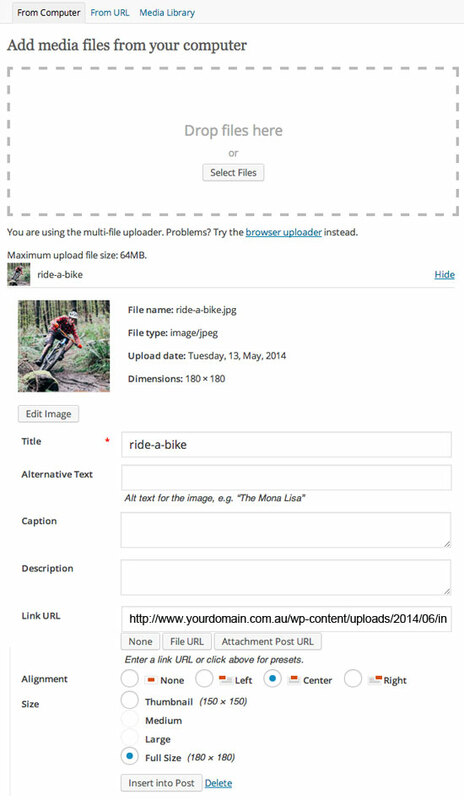 Obtain your link to the file. From the left side of your Dashboard click on ‘Pages’. From the list of Pages find the Page you want to add audio to. Mouse-over the Page Name and click on “edit”. 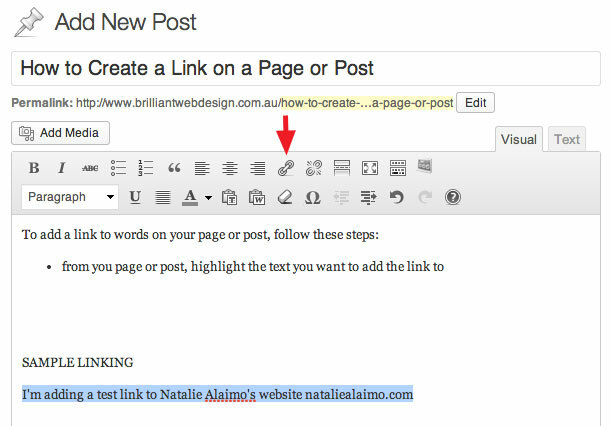 Once on the ‘Edit Page’ highlight the text you want to add the audio to and click on the ‘link’ button in the tools above the text. 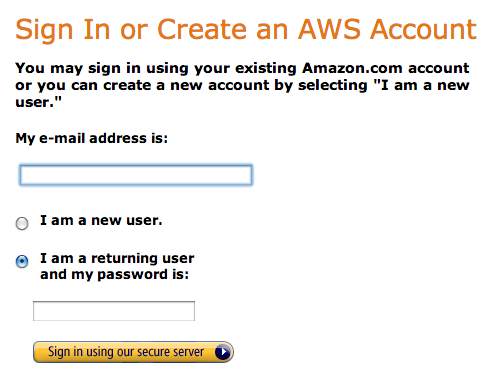 Enter the ‘Destination URL’ that you obtained from Amazon S3 account . Click the blue ‘Update’ button to save the page. From the list of Pages find the one you want to delete. Once on the ‘Edit Page’ click on ‘Move to Trash’ from the right hand column. From the left hand column mouse over Tools. 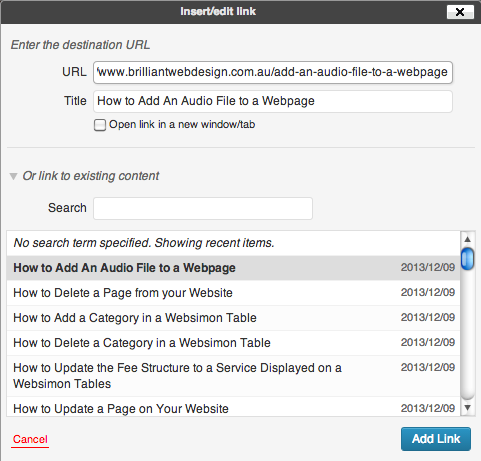 From ‘All Tables’ find the table you want to work on and click on ‘Edit Table Content’. Select where you want to add the Category. Click on the ‘L’ shaped arrow to add a row. When the details are correct, click on ‘Save Table Content’. Find the Service that you wish to delete. In the left column, click on the X to delete that category. Click on ‘Save Table Content’. Create a ‘Button’ in PayPal and save the code. Find the Service that you wish to change the fee on. In the ‘Payment’ column delete the PayPal code and paste your new code. From the list of Pages find the one you want to update. On the ‘Edit Page’ make the changes you want. In the right hand column, click the blue ‘Update” button. Is a Mobile Website Really Necessary? Clearly there are more and more people using mobile devices to visit websites. We’re seeing smart phones and tablets everywhere. And people are browsing the web on them. So what are we to do with our website? Search the web and you will find many articles and blogs that talk about why we need a mobile website, and just as many who talk about why we don’t need a mobile website. Now we’re talking about a separate website for mobile devices than the one that you would have for regular browsing. That’s two website, right? What does that actually mean? Well it means that a company will take your website, strip it down and build a new site on a sub-domain of your regular domain. Whoooah … and how would that work? Well it means that you have your regular website, and if someone is browsing your regular website on a mobile device, it will be detected that this person is on a mobile device and the mobile website will be displayed. Sounds OK? Sounds OK, but is it really OK. It depends on how you want to treat your customers and potential customers. Generally we take a lot of time to plan our websites and the content that we want to put on them. Painstakingly writing content to fit our market, talking about the things that matter to our customers and readers, selecting the right images to depict what we are saying, helping our customer to make buying decisions that will be the right ones for them … and more. So do you really want to deliver a cut down version of your website to your customers? Not me! No. My customer deserve to be able to see and read all the information I have created for them. They can pick and choose what they read, not chosen by someone who has decided to create a mobile website from a regular website. I’ve seen some of these mobile websites. I’ve seen pages been stripped down from over 500 words to less than 100. We must remember that not everyone using a mobile device wants to see a stripped down website. There will be customers and potential customers who will choose not to have a regular computer at all. Many will choose just to have a tablet as their main internet connection. Does that mean that most of your customers will be missing out on most of the information on your website. The nature of shopping is constantly changing. Many people browse websites to get information prior to purchasing, and many of them are browsing on mobile devices. 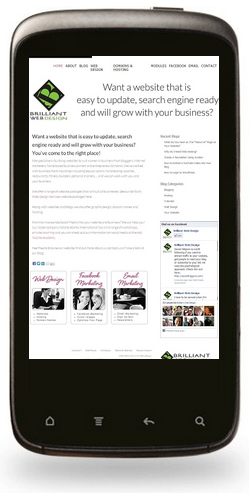 Do you want to deliver only a fraction of your website to your potential customers? I think not! Well as we know technology is constantly changing. We don’t know what the best way will be to deliver mobile websites in the future, but right now a Responsive Website is probably the best way to go. Isn’t this the way you would want to be heading with your website?